In the bathroom there are two main areas where the curtains are used. These are the bathing area and the windows. Notice how these curtains play different roles and although they may look alike, each one is specifically made for the area where they are installed. The two different bathroom curtains can differ in the materials used for each. The bathroom curtain found on the window is usually made from softer material while the one installed on the bathing area is designed to be able to deal with water. Sometimes you could try to interchange the type of material used for these curtains however you can’t expect them to work as well as the original curtain meant for this area. Another difference of the bathroom curtains is their function. This is what really separates the bathroom curtain used for the windows as window treatments and the bathroom curtain used for the bathing area as shower curtains. This is also the reason why the material for these two curtains is different. The window in the bathroom, no matter how small will still give the feeling of a space beyond the room. It still contributes to the bathroom in terms of preventing the feeling that air does not enter nor escape the room. Giving attention to the window by highlighting it with a bathroom curtain will help people to notice that it’s there. Another important purpose of the bathroom curtain installed on the window is that it helps people to maintain enough privacy when they are inside the bathroom. Privacy is a basic need inside the bathroom. It is actually one of the things people enjoy in this room. Of course, no one wants to be seen attending to their personal business. On the other hand, the bathroom curtain for the bathing area also plays an important part. More popularly known as the shower curtains, this type of bathroom curtain plays the part of the enclosure of the bathing area. Enclosures are needed in the bathing area to keep the rest of the bathroom dry. The bathroom shower curtains keep the water within the bathing area. It keeps the splashes of water and soap suds from reaching the other parts of the bathroom. 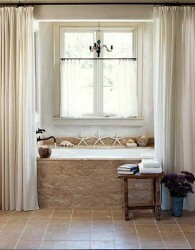 This curtain also creates a distinct separated space for the bathing area. Without the bathroom shower curtain it would be very difficult to maintain a clean and dry bathroom. The two bathroom curtains play very different but important roles in the bathroom. They do more than just dress up a certain area in the room. These curtains actually contribute to how the bathroom looks and feels overall. They counter the coldness of the tiles giving the room a bit of warmth and softer texture to balance the feel.